Plaque psoriasis is a chronic condition that is characterized by large, raised, red patches on the skin that are covered with a silvery-white buildup of dead skin cells. Sometimes these patches, or plaques, can appear scaly and flaky, and they are usually found on the scalp, knees, elbows, and lower back. Plaque psoriasis can be a difficult and often embarrassing condition to live with, but there are a few things that you can do to minimize your symptoms. Besides drugs and skin care products, there are a number of lifestyle changes that can make your skin look and feel better by calming flare-ups, removing scales, promoting healing, and soothing your itchy or inflamed skin. Keeping your skin moist will reduce dryness, itchiness, redness, soreness, and scaling. Everyone’s skin is different, so choosing your moisturizer might take some trial and error. The natural dryness of your skin, as well as the weather, will play into which type of moisturizer will work best for you. Ointments will be the thickest and heaviest, making them best at locking in moisture. Lotions will be a lot thinner and smoother, while creams will be somewhere in the middle of these extremes. Whichever moisturizer you choose, apply after showering and as often as you need to throughout the day. Colder or drier temperatures might require you to apply more often. A daily warm (not hot) bath can remove dry skin and soothe dry, itchy spots. Instead of harsh soaps, add oil, finely ground oatmeal, Epsom salt, or Dead Sea salt to the water and soak for 15 minutes. Afterward, gently pat dry—rubbing your skin with a rough towel can make sores worse or cause new ones. It is proven that UV light soothes, improves, and heals psoriasis lesions. Just remember that a little bit of sunlight can go a long way—sunburns may make your outbreaks even worse. Modest amounts of sun therapy just two or three times a week while using sunscreen on your healthy skin is the best way to start off. It is our natural reaction to want to scratch an itch. 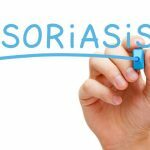 But it is important to remember that when it comes to your psoriasis, scratching will only make things worse. It can lead to new sores and even infections. Gently rubbing on moisturizer instead is much more beneficial and may also ease the itching as well. A healthy body means healthy skin. Putting damaging substances such tobacco and alcohol in your body on a regular basis can trigger flares and make your psoriasis symptoms much worse. Heavy drinking can also produce dangerous side effects when combined with some psoriasis drugs. If you want to quit smoking, talk to your doctor before using nicotine patches, as sometimes these can make your psoriasis worse. What’s the Difference Between Colitis and Crohn’s?